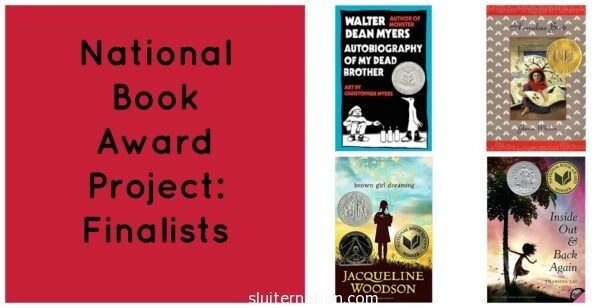 All the way back in June I started a project, spear-headed by Dr. Steven Bickmore, with a bunch of other educators: We read through all the National Book Award Finalists and Winners from the past twenty years. There were twenty of us–each assigned a year. I read the five books from 1996. Each of us chose one book to move forward to the next “round”. We were then placed into brackets of five books and as a group we needed to choose which of those five would move to the final round. The final round has four books. Our task was to read all four and vote for which one we think is the best of the best. I had already read Homeless Bird (2000 National Book Award Winner), but the next three were new to me. As is typical of Myers, this book starts out right in the action with the funeral of a teenager who was shot in a drive-by shooting. Jesse and his friends, CJ and Rise, are forced yet again to consider how quickly life can be taken away. Rise makes the comment that he believes this is why you have to live every day as if it’s special. All three boys grapple with how to do this, but Rise seems to take it to an extreme that Jesse can’t agree with. As Jesse tries to decide to stick by Rise–his blood brother–or follow his own intuition, he sketches Rise and the rest of what they experience. It’s a very honest look at what being a teen in Harlem is probably like. Ten-year-old Hà, her three older brothers, and her mother are forced to leave Vietnam when the war reaches their home in Saigon in 1975. Hà has never met her father, who is MIA in the war–possibly somewhere in North Vietnam where communication has been cut off. The family journeys by ship to Alabama where they become refugees. Hà is forced to repeat the 4th grade even though she was at the top of her class in Vietnam because she doesn’t know English. What is most special about this book is that it is told in first-person verse covering a complete year: from Vietnamese New Year in 1975 to the same day in 1976. Another book completely in verse, Jacqueline Woodson tells her autobiographical tale of growing up African American during the civil rights movement in the 1960’s and 70’s. Her life is split between two homes: one in South Carolina with her maternal grandparents and one in New York City with her mother. Her poems seamlessly weave her life story together in a way that the reader can actually feel. It’s beautiful writing. Of the four books, I really liked Homeless Bird and Autobiography of My Dead Brother but I loved Inside Out and Back Again and Brown Girl Dreaming. I also felt all four books would be appealing and accessible to my students (all 8th grade). They were all well-written, though I think the three I described here were a little more literaturey (yes, I just made that up) than Homeless Bird. Or maybe it’s that Homeless Bird is about a culture different than the author’s. In the end, Woodson’s poetry did more than just tell a story; it created an experience; therefore, it got my vote as the best National Book Award Winner of all time.